You are not logged in. 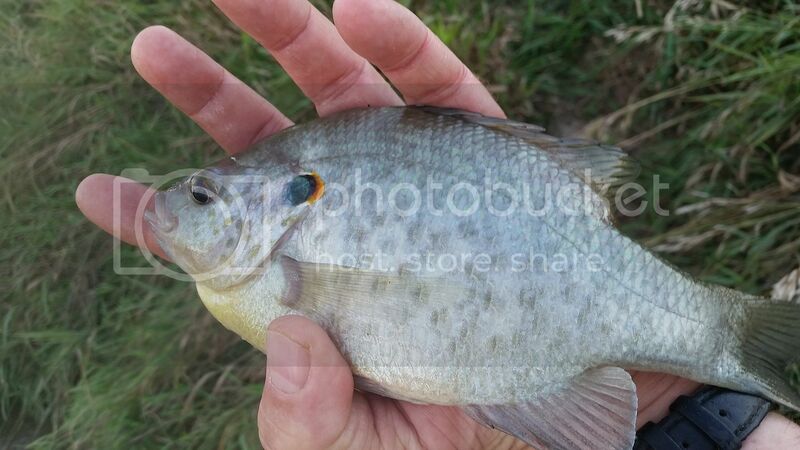 [Log In] Pond Boss » Forums » FISH & FISHING » Sunfish-Including Largemouth and Smallmouth Bass » Same RES? #412670 - 05/25/15 05:17 PM Same RES? I caught this one today (5/25/15) at 12:26 PM. 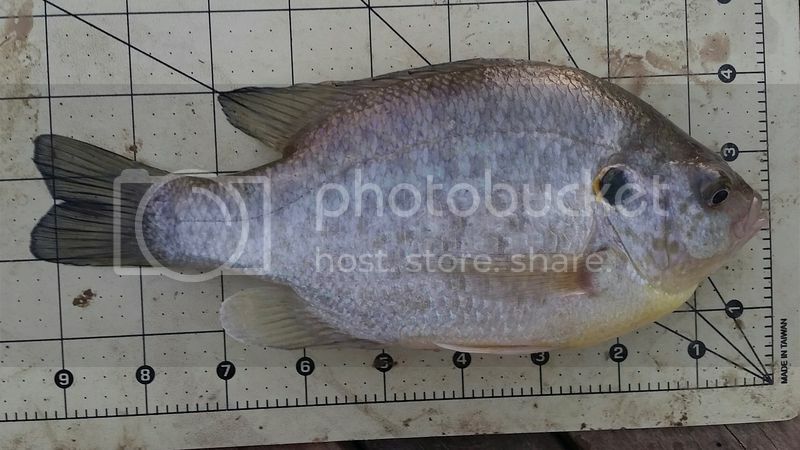 Looks like the same fish to me, the ear tab looks identical. 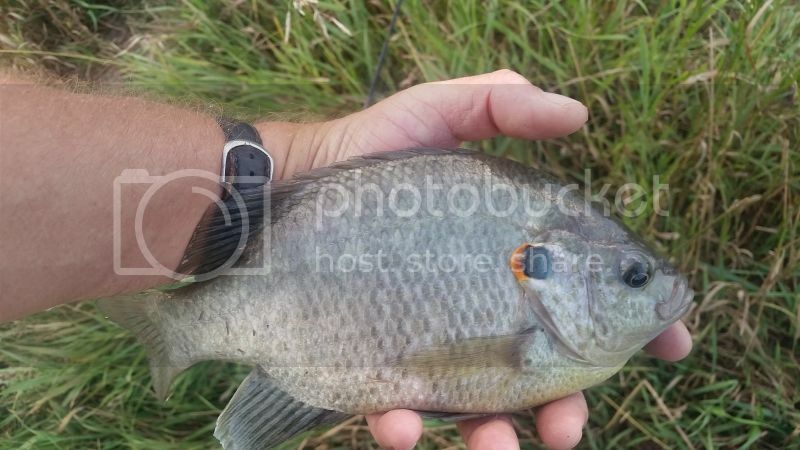 Both are likely males, and both were caught on the shallow area of pea gravel at the north end of the dam. If they are both the same fish, then they both fell for the same artificial bait more than once. All orange margins...anything red thus far? My males seem to exhibit red, what I thought were females have orange. I have zero clue on your fish...I'd have to guess the top fish male, the second one, ugh - I don't know. This is how one makes critical mistakes when stocking an experimental pond for BRES hybrids. I've done that a few times already. Given my current water clarity the ear tabs are much brighter than my females, I currently have 6" of visibility. I am pretty sure both of these are males, check out the other thread with the corresponding photos of the urogenital openings. 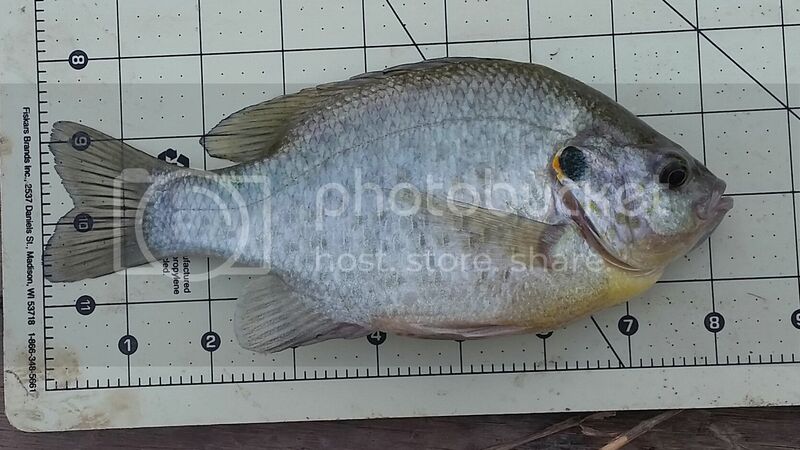 I caught quite a few 6" RES today, most of them were female. Look at the mottled patches on the gill plates. They also look identical to me for both fish in both sets of pictures. 3rd time? 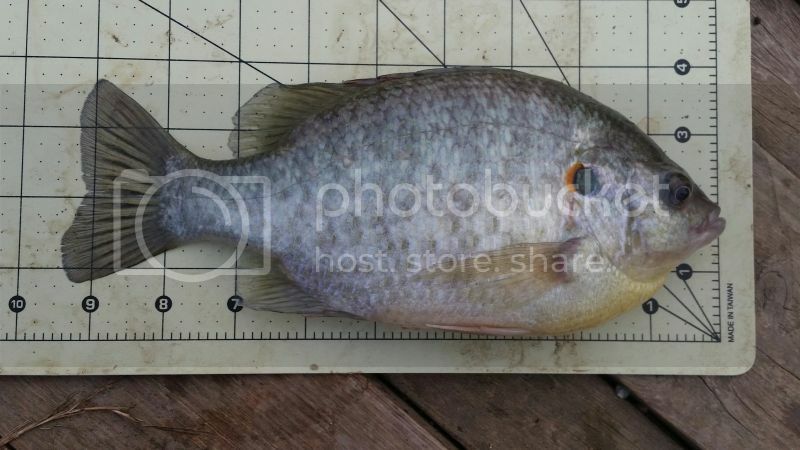 This is the fish I caught tonight and posted different pictures in the "Sexing RES?" thread. This picture shows the ear tab better. I think the first two are the same fish or identical twin. The last doesn't match the first two IMHO. Here is another set for comparison. 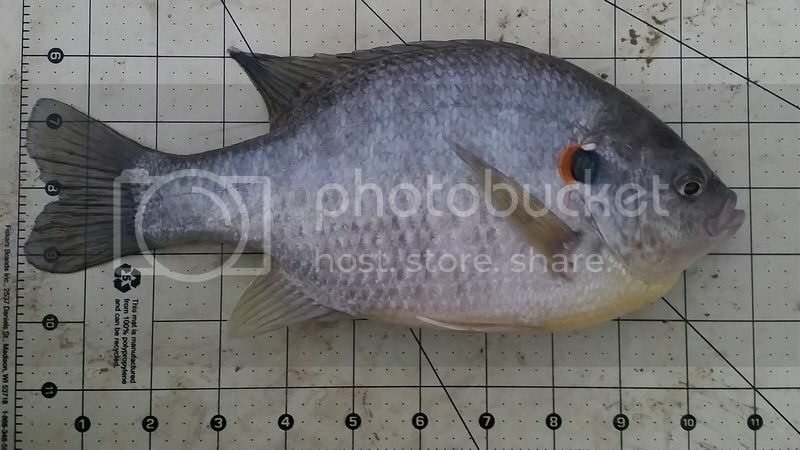 Aside from the slight opecular tab white mark difference, the other markings on the fish are close enough for me to guess that it's the same fish. The "slight opercular tab white mark" really isn't white, but it is highly reflective area when looking at it with the right viewing angle, and it is a somewhat narrow viewing angle. You normally don't notice it unless they are flaring their ear tabs out. Both the top and bottom of the ear tab have this highly reflective spot. The only time I ever noticed this "white spot" in my aquarium was when my RES were getting aggressive with each other and flaring their ear tabs out, it is almost a silver/white flash. There is also that small dark spot on the base of the pectoral fin that matches in both pictures. Most of the RES pictures I have taken this year don't have any dark spots in that area. 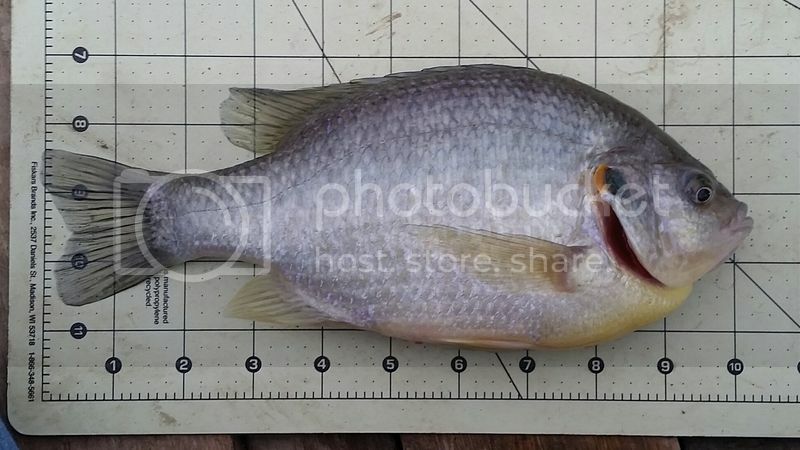 If I recall correctly, the August 8th fish picture was just a hair under 10" (9-7/8") when I measured it and didn't qualify as a Nebraska master angler. For comparison, here is the one I posted in the "Sexing RES" thread last night. My suspicions have been confirmed. Shorty really just has a 200 gallon stock tank that he put these fish in. He just goes out there and dips them out with a net. Just kidding. I am amazed at how you have perfected your res fishing, and I am taking careful notes. Keep it coming! Cray, I recently went back and read every post in this thread. Alright, here is another one to ponder. that fish is UNREAL!! What is the key to their growth? Is it abundant forage? special genetics? aggressive pellet feeding? Is it your water quality characteristics? I know, I know, you could tell me but then you would have to shoot me right? Shorty hand raised these fish indoors and they imprinted onto him as their "buddy". They miss is attention so they bite his hooks to get "handled" for affection. Bill, my RES still "despise me". 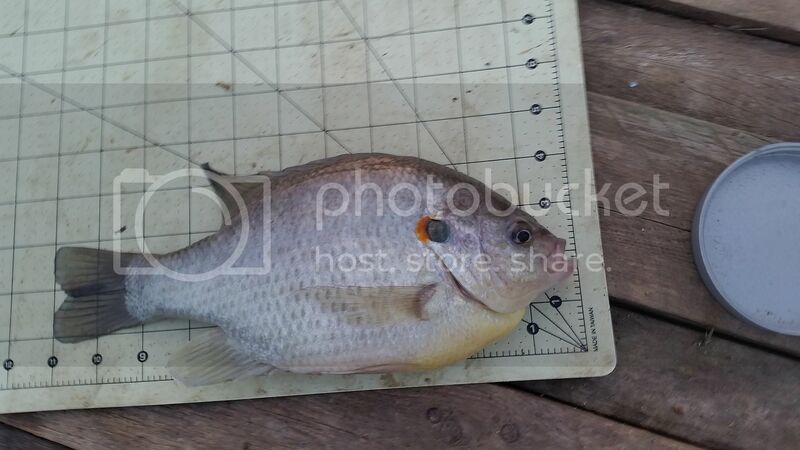 I did pellet train about 7 dozen RES during the summer of 2013 that had hatched the year before in the pond. 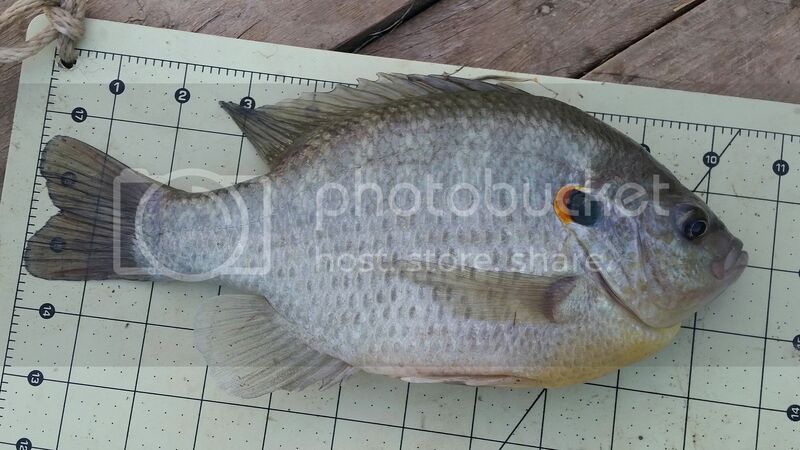 I think I have quite a few RES that are eating pellets and young of the year golden shiners. The GSH spawn over the last two years has been unreal. Have caught many RES on small/mini minnow type crank baits. 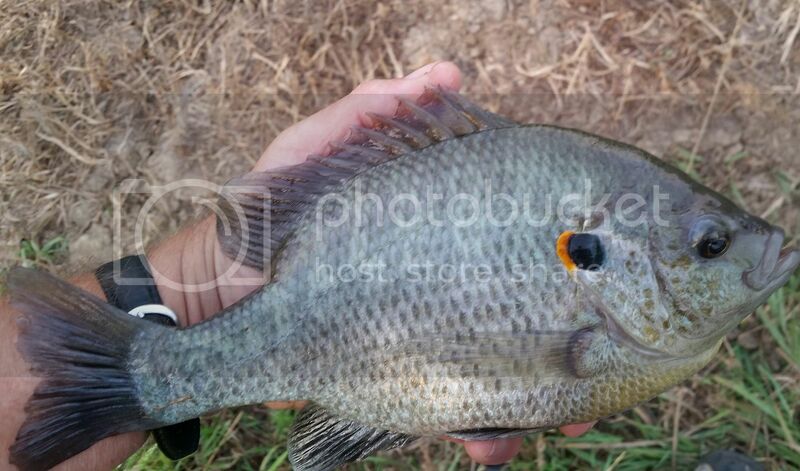 why not clip a fin or tag a couple to keep records of how many times you catch them? Will that work? I'm OK with just taking pictures of RES. Every once in a while one looks kinda familiar so I can always check my pictures. Let em know if you would like to see closer pictures of the cheeks with the contrast slightly enhanced. Is this the same fish? I think so. 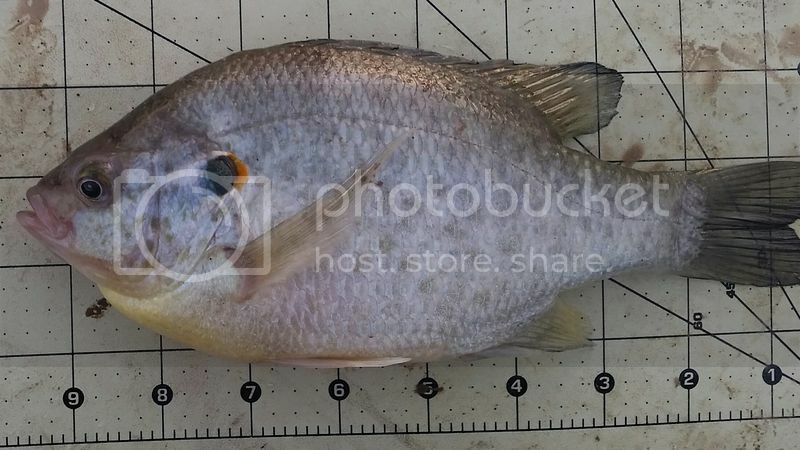 I try to compare gill flap markings in your pictures, unless there is an obvious mark on the body.